Of all the reports of UFO sightings, some of the most intriguing ones are those which come in flaps, or waves, have multiple witnesses, and photographs. One of the most celebrated cases of this type was the Belgian flap which began in November of 1989. The events of November 29 would be documented by no less than thirty different groups of witnesses, and three separate groups of police officers. All of the reports described a large object flying at low altitude. The craft was of a flat, triangular shape, with lights underneath. This giant craft made not a sound as it slowly and fearlessly moved across the landscape of Belgium. There was free sharing of information as the Belgian populace tracked this craft as it moved from the town of Liege to the border of the Netherlands and Germany. This first startling sighting would evolve into a wave over the next several months. On two occasions, a pair of F-16 fighters chased the mysterious object, but to no avail. On March 30, 1990, a frantic call to military headquarters came from a Belgian national police Captain. He marveled at a giant triangle passing over and simultaneously two ground radar stations were reporting an object of unknown origin on their screens. One of these bases was NATO controlled near the city of Glons, southeast of Brussels. After contacting other radar facilities, they learned that at least four other stations were also reporting the object on their screens. The object was moving across their screens slowly, and failed to send a transponder signal to identify itself. Two F-16s were ordered to intercept and identify this phenomenon, and one of the jet’s radars locked the object in. It appeared as a small diamond on the pilot’s screen. The pilot reported that only a few seconds after locking on the target, the object began to pick up speed, quickly moving out of radar range. An hour long chase ensued, during which time the F-16s picked up the strange craft’s signal two additional times, only to see it fade from view. The triangular craft seemed to be playing a cat and mouse game, and finally was lost in the night lights of Brussels. The pilots of the fighters reported that the UFO had made maneuvers at speeds beyond the capability of their technology, and once the radar showed the craft drop from 10,000 to 500 feet in 5 seconds! The extraordinary sightings continued for months as the triangular invader was witnessed more than 1,000 times, both day and night. The object dipped low enough to easily be seen with the naked eye, and the event became one of the biggest stories in the Belgian media. Another unusual occurrence associated with the Belgian flap was the inability to take a clear photograph of it. Many observers had their cameras ready, and took what they thought would be clear images, but when the film was developed, the image was blurred, and the craft’s outline was vague at best. This anomaly was addressed by physics professor Auguste Meessen, who was employed by the Catholic University at Louvin. Meessen’s investigation produced a theory that infrared light must be the reason that almost all the images were unclear. To put his theory to test, he exposed film to infrared, then photographed objects in regular light. The results were the same as the photographs of the triangle-shaped UFO. One good image was finally captured on video tape in April 1990. This image showed the underbelly of the craft with spotlights on the three corners. A still frame from this tape has been seen worldwide, and is a classic UFO photograph. 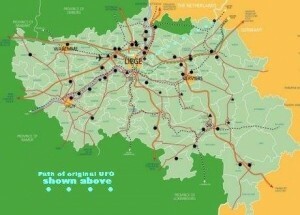 The Belgium wave has obtained classic status in UFO lore. With over 1,000 witnesses, confirmed radar sightings, plane radar lock-ins, and military confirmations, the fact that an unknown craft moved across the country of Belgium cannot be denied. The case is also important for its unique information sharing. Civilian and Military officials were forthcoming with the reports, and set a model for others to follow in their pursuit to uncover the mystery behind the UFO enigma. In April 1990, a photo of a triangular object upon which three lights are visible at each corner was taken by Patrick M. Since then, Patrick M. came out and stated publicly that the picture was a hoax by him. Skeptics say there is no background in the photograph and no element that would allow calculation of the object’s size or distance from the camera. Wim van Utrecht, a Belgian skeptic, has reproduced a copy of the photograph with devices. A computer graphics simulation method to reproduce the photograph was developed by a Belgian mathematician, Thierry Veyt at The University of Liège Laboratory of Astrophysics, wherein the apparent “shake” motion, that results in the lights of the craft appearing blurred or out of focus in the photograph contradicts eye-witness statements. This, along with the anonymity of the photographer and fact that the image was not produced publicly until 4 months after the alleged event, brings the authenticity of the image into question. 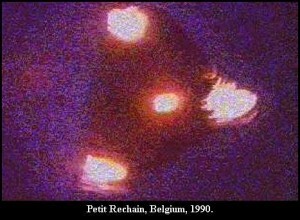 For 20 years, the ufological organization Société belge d’étude des phénomènes spatiaux (SOBEPS) claimed that this picture was genuine. But on 26 July 2011, in an interview for RTL, a Belgian TV channel, Patrick M. confessed that it was a hoax.